E-7 ($7.00) 11 x 14. 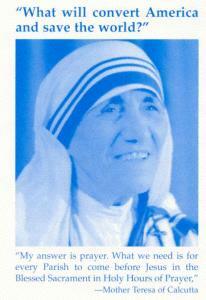 Top: “What Will Convert America and Save the World?” Picture of Mother Teresa. Bottom: What we need is for every parish to come before Jesus in the Blessed Sacrament in Holy Hours of Adoration."